Since I loved blogging every day this year for The Wildlife Trusts’ 30 Days Wild. I decided to trawl the internet for photo/blog challenges for December. There were many ideas on Pinterest but none were current. So I decided to create my own from a couple of suggestions I found. Here’s what I came up with. After I had compiled my list, I decided to do another online search with a hashtag and found a few current lists on Instagram. The hashtag I used was, #decemberphotochallenge2018, if anyone would like to join me? Have you ever been interested in blogging for a month? Already have, if so what did you like/dislike about the experience? What suggestions for December would you have chosen for your list? Thanks for reading and have a happy December! Wishing all my lovely readers a very Merry Christmas and a Happy New Year. I’ll do a year review and look ahead to 2016 after the weekend! One Wedding and a Sunday! Saturday dawned brightly. The past week had been rather dreary, energy sapping really! 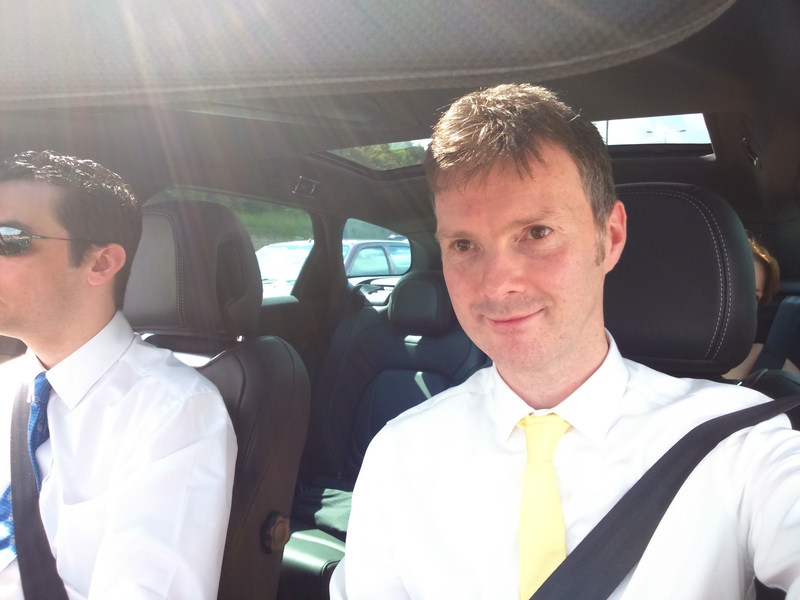 However, the warm, late summer weather arrived just in time for Paul and Gemma’s wedding! The wedding was to be held at Wainstones Hotel, Middlesbrough, North Yorkshire at 2pm. We headed across country dressed in our finery with David’s cousin Keith. The journey from Liverpool would usually take about 2.5 hours, though it took a bit longer due to road works on the M60 and congestion for the Leeds festival! We stopped off at Wetherby Service Station to refresh, but due to the sheer volume of traffic and the inability of the car parking staff to guide drivers to free parking berths, we were a lot longer at this stopping station than usual. This hold up meant that we would arrive at our destination with just minutes to spare. Thankfully the bride, Gemma was fashionably late and we managed to arrive in time, find our table and be composed for the ceremony! The ceremony itself was emotional, and I found it hard to control my tears. I don’t know what it is about wedding ceremonies but they always make me blub… A candle was lit for those family members not able to attend the celebrations, something if I ever marry, I may adopt. Once rings and kisses were exchanged the bride and groom headed out to the garden for photographs. Before the Wedding Breakfast, came the speech from Gemma’s Father, which was also very emotive! A blend of Elderflower and Prosecco was served for the toast. It was very light and something I could try in the future! Then came the home made meal, something my poor grumbling stomach had hoped for. It had not seen food since 8.30am that morning! I had already banished a migraine with a tablet, thankfully! The food was served hot and the starter of tomato soup was tasty, I even had David’s bread roll! The main event that I had hoped for, for so long (as usual), sadly fell short of expectations. I was the only vegetarian at the breakfast and weeks before the wedding I was given a menu of meals to chose from and I (eventually) decided on the Goats Cheese and Sun Blushed Tomato Risotto. 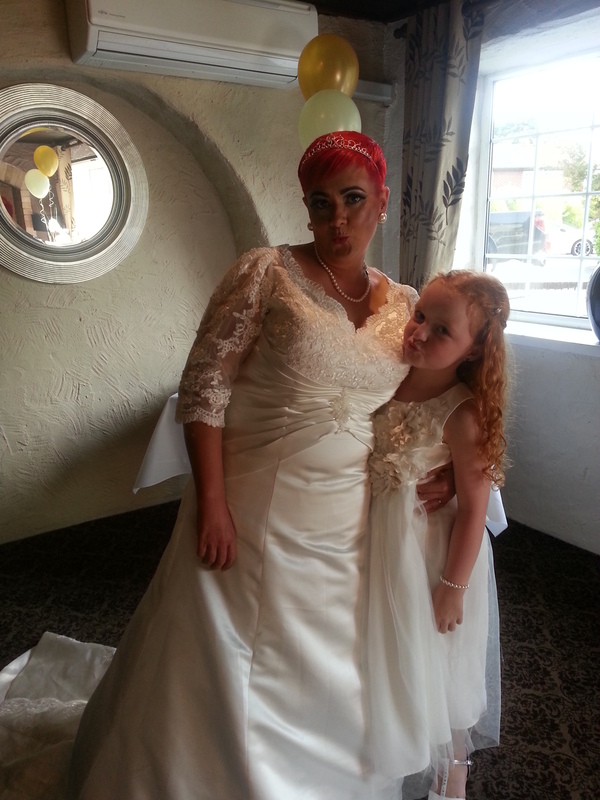 I thank the bride Gemma and the wedding team for being so patient with me! I love goat’s cheese but not in excess. I don’t want to sound like I am complaining. However the meal, was not as I had imagined. I had imagined a risotto with a sun blushed tomato sauce with the goat’s cheese sprinkled on top. The reality was that the goat’s cheese was mixed in with the sauce. It would have been ok, if it was not for the amount of goat’s cheese… a little too much, and it became rather sharp and sour on the tongue! The pudding also was not as imagined, though if we were a little more aware of restaurant food maybe we would not have been surprised! The profiteroles with white chocolate creme patisserie, was a little too eggy than hoped for! Though we were thoroughly stuffed for it to matter! Other people on our table had roast beef and for pudding creme brulee and they didn’t complain! 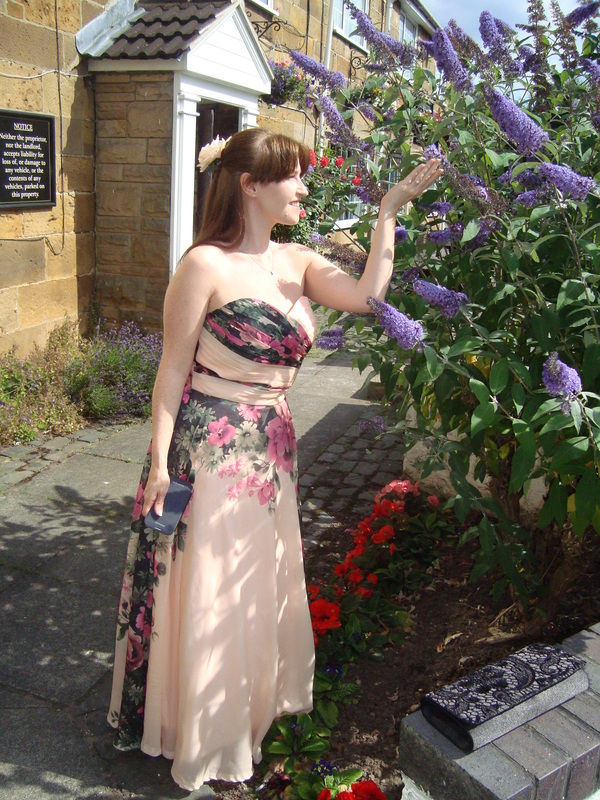 After the Wedding Breakfast we ventured outside to enjoy the warm sun, listen to bees busy around a Buddleia and Swifts swoop across the sky! Once we ventured back inside, the function room had been rearranged for the evening festivities. 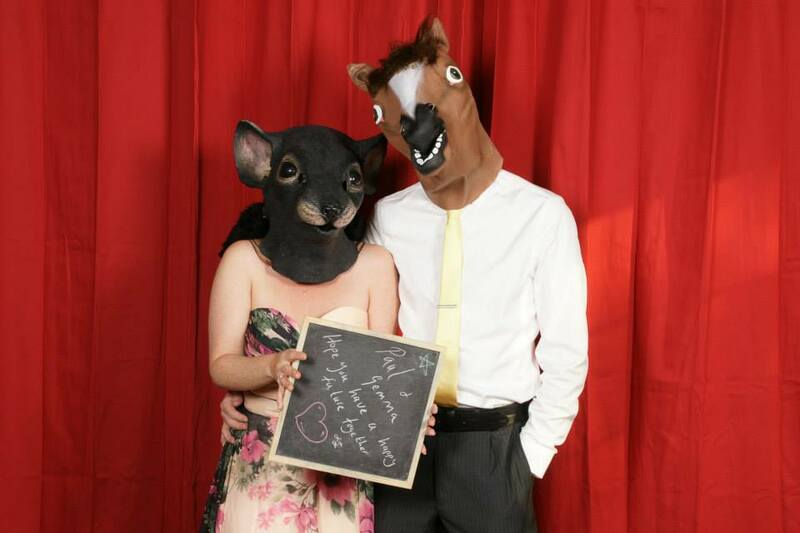 We sat at a table that was adjacent to a photo screen and a photographer (Phantom Imaging) with lots of props! They came over to us with a calk board and asked us to write something for Paul and Gemma and to try on their costumes as a test! Our child selves, didn’t have to be asked a second time! 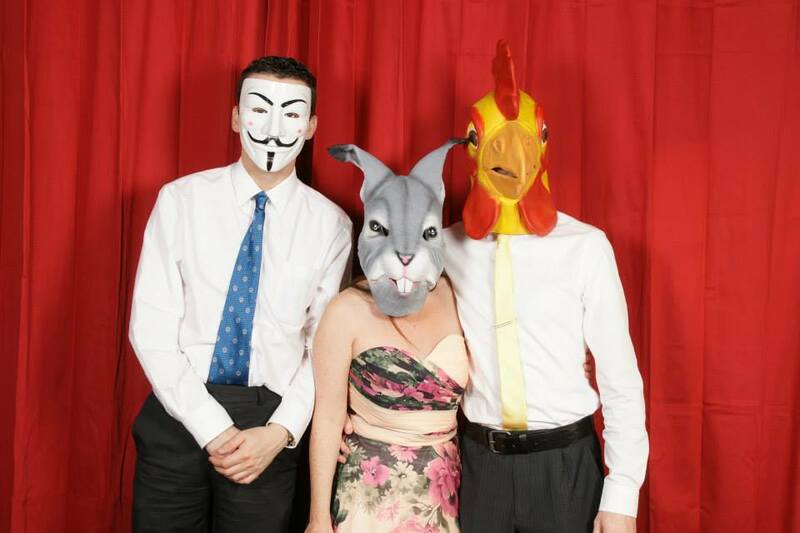 Here’s a few picture of us and Keith dressing up with Gemma the bride! We also posed for a group shot of David, Keith and myself! David got footage of Paul and Gemma cutting the cake and of their first dance together! After ten o’ clock we said our farewells and left the gaiety as we headed back home. My poor Artie was missing us! We had a fun time together and enjoyed being a part of Paul and Gemma’s celebrations! Come Sunday we were tired and worn, after not getting home ’til after 1am! Then after a broken sleep the household chores beckoned! 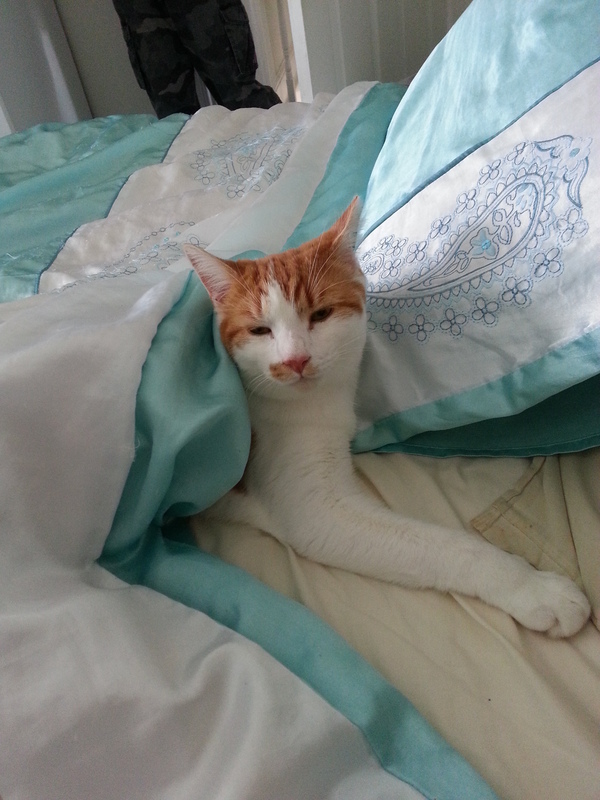 Poor Artie who doesn’t like Henry the Vaccum cleaner hid under the bed covers! 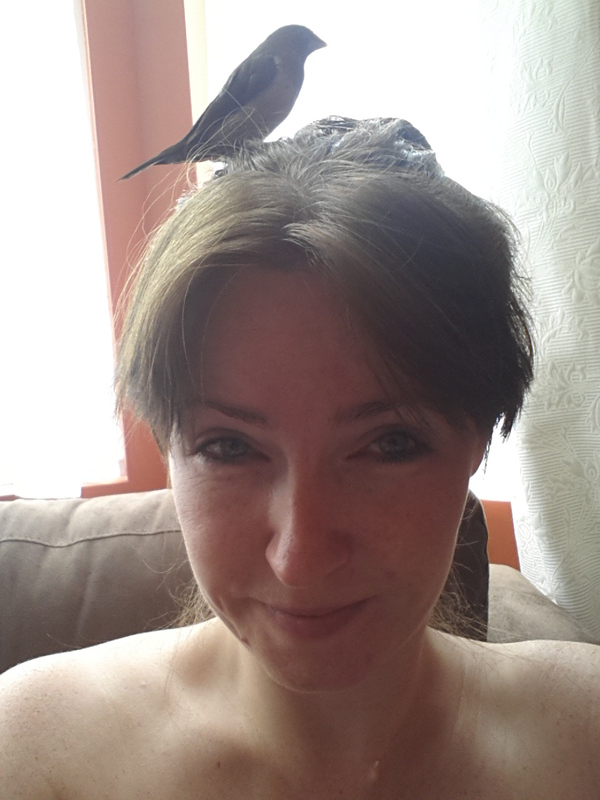 I spent lunch with the finches and bold Romeo even sat on my head trying to harvest my hairs for a nest! 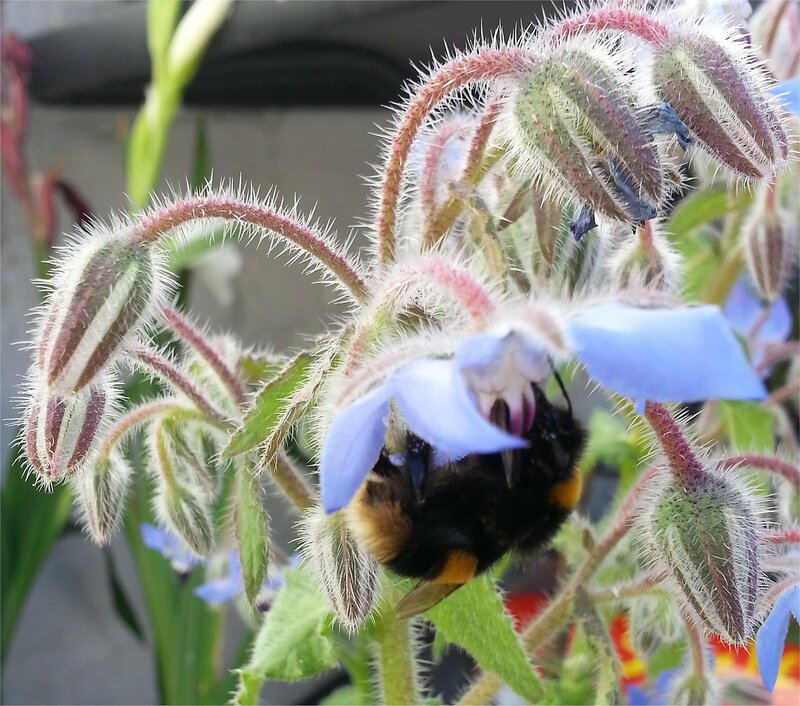 Come the evening I watched at Sparrows and Goldfinches visited the sunflower heart feeders and bumblebees/leaf cutter bees enjoyed visiting the Borage. I also caught a striking sunset! 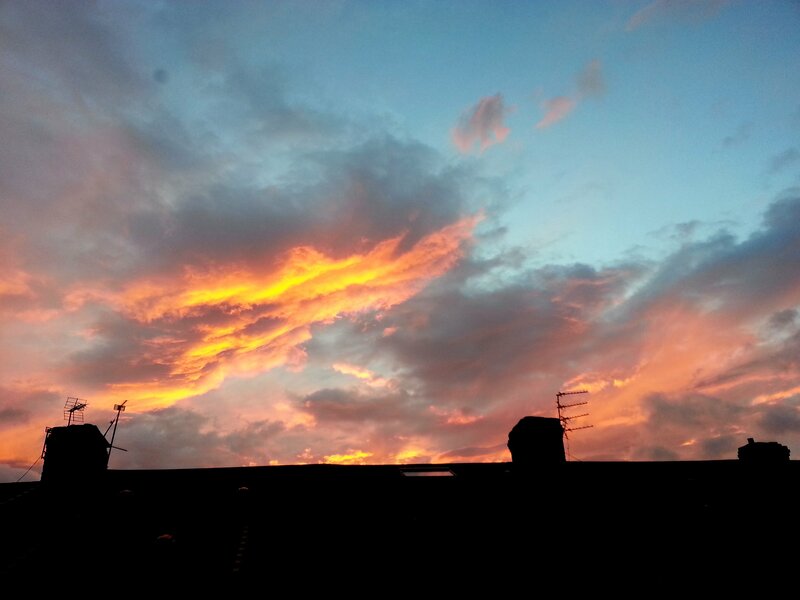 Red sky at night…. hopefully tomorrow’s weather will bode well? This bank holiday weekend coincided with Cunard’s 175 year celebrations here in Liverpool. The city witnessed a three day spectacle as Cunard’s three Queen passenger ships visited the River Mersey. On Sunday the Queen Mary 2 docked at port and in the evening there was a laser display projected onto the three Graces followed by fireworks. Monday was the main event! The Queen Mary 2 was to leave Liverpool to meet and greet her sister ships, Queen Elizabeth and Queen Victoria. So, David and I decided to go to Crosby Marina in anticipation of seeing the ships. I am afraid I got carried away with all the excitement around this event. 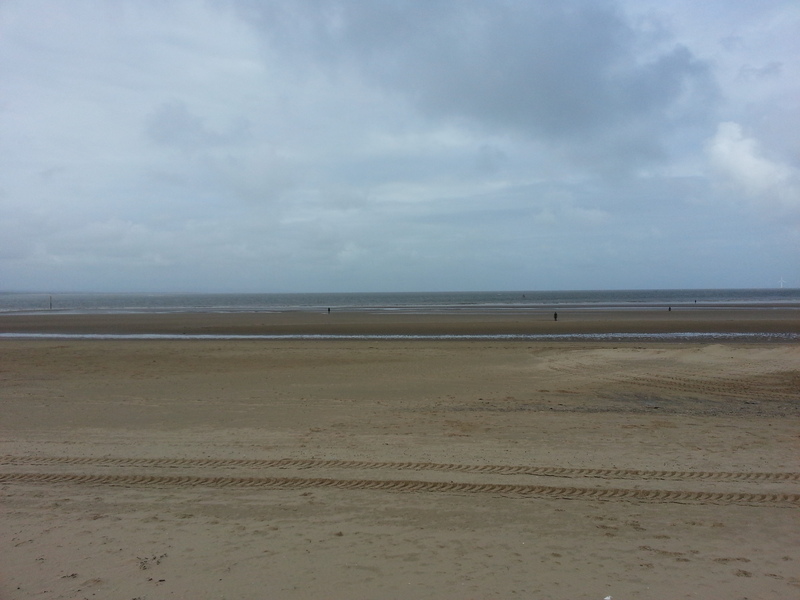 So on a cloudy, cold Monday morning (25th May 2015), we headed to Crosby. We arrived just after 9am. We managed to find a street to park the car and walked towards the beach. Other sightseers were walking the coastal path, laden with chairs and binoculars, both of which David and I could have brought with us if we had thought on. However, we had to be content with standing as we overlooked the beach dotted with Sir Antony Gormley’s Another Place statues and brave the relentless onslaught of the chilling wind. It felt more like winter than late spring! We stood in total for three hours during the spectacle. I could not feel my fingers they were that cold! Other spectators also shivered as we all waited for the Queen Mary 2 to leave her berth and make her way to the mouth of the Mersey to greet her two sisters. The crowed swelled. Many even went out towards the edge of the tide (that was going out) to get a better viewpoint. Where David and I stood was good enough, over looking the coast but high enough so no one could be in the way! In the Irish Sea out in the distance we could see the Queen Elizabeth and Queen Victoria as they made their joyous approach to the city. Seeing them draw ever closer gave us something to distract from the cold. The sun briefly made an appearance before being blanketed by a thick bank of cloud that did not shift. I was afraid that none of my pictures of the event would come out due to shivering too much! Then from around the headland the top of the Queen Mary 2 could be seen, she looked so close! She had left Liverpool at 10.45am. The crowd seemed to buzz with excitement. Cameras started clicking and I juggled with three! The Queen Mary 2 lead by the mighty Mersey Ferry stopped opposite where David and I stood. She sounded her horns to her sisters. The horns sounded so forlornly to me. The crowed cheered in response! As Queens Elizabeth and Victoria came closer along the coast, Queen Mary 2 pivoted and faced her bow back towards Liverpool. Queen Elizabeth was the first to pass Queen Mary 2 heading along the river, followed by Queen Victoria. Queen Mary 2 brought up the rear as they both followed Queen Elizabeth in a cavalcade towards more awaiting crowds in the city! With the Queens’ departure the spectacle at Crosby was at an end! While David and I returned home, the Queens paraded up the Mersey and turned 360° before lining up side by side in front of the Cunard building, one of the three Graces. The ships seemed to dwarf the city’s skyline! There was even the obligatory fly over by the Red Arrows en-route to Blackpool! Their flight path took them over our house. A thundering sound announced their approach but it was over too quickly for me to get my camera out. I saw nine red jets flying in arrow formation from my living room window! I watched the remaining festivities at the Pier Head via webcams. After the three Queens had lined up before the Cunard building the city said its farewell to Queen Mary 2. Queen Victoria docked and Queen Elizabeth anchored in the middle of the river, but she too would leave the city after the second showing of the laser show and fireworks. Queen Victoria would leave the city on Tuesday.